Rottweilers are known for being a strong breed. They are quite large, ranging from 75 to 130 pounds, depending on whether your Rottie is a male or a female. When you are taking them for their walk, they probably want to go where ever they want, and sometimes they succeed, pulling us halfway across the neighborhood before we can get them to stop. This is very bad behavior, and you need to establish a dominant role in your Rottweiler’s life so you can start taking control of them, and not let them take control of you. This is not an easy task, so I am not going to pretend like it is. You must establish a dominant role if you want your Rottweiler to respect you. This starts in the home. At dinner time, you must always eat your dinner first, then feed your Rottweiler. And no table food! This is a good place to start establishing the dominant role. Also, when you are walking around your house, and your Rottie is following you, make sure you always enter and exit the room first, letting your Rottweiler follow behind you. But it is not that simple, make sure you invite them in or out with you. Using their name, tell them, “come on.” Wait for them to follow you and then reward them with a pat on the head. 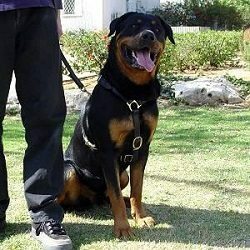 When walking your Rottweiler, try to maintain that same level of dominance you are using in your home. Always control what direction you will be walking, and when the walk is over. You can do this by always making sure your Rottweiler is next to you and not in front of you leading you around. Following, I will explain how you can practice this exercise. First, you must not let your Rottweiler get away with pulling on the leash. If they are pulling, it is important to not pull back. Stand your ground. Be very firm. If you pull back, you only create a tug of war situation, and your strong, bull­headed Rottweiler is always going to win. Instead, just keep your grip firm, show then that this is not a game, and that you will not give them any more leash than what you are offering them. And always reward good behavior with plenty of praise. Next is an exercise that may become frustrating and keep you literally walking in circles, but it is essential in teaching a Rottweiler to understand that they may not take control of the walk, only you can. When you Rottweiler starts to pull in one direction, simply turn around and walk in another direction. When you turn around, make sure you stand your ground, do not give them extra leash, and continue walking in the direction you choose with your eyes forward and confidently walk ahead of them. As soon as they start to try to dominate the walk, turn around and go in another direction. Continue this exercise until your Rottweiler understands that this is how you behave when walking on the leash. It will take patience, but that is a part of training. We all know Rottweilers can have a one track mind. They can become easily distracted, especially when they are excited about going for a walk. Anytime you take your Rottweiler out of your home and into a new environment, there are always going to be distractions. Whether that distraction is squirrels, people, other dogs, loud construction, or traffic, we must keep our Rottweiler focused on us. This may require you to bring along a toy from home that your Rottie likes to play with. Or even a few treats or pieces of dog food. These tools can now be used to avert distractions. If your Rottie is walking along with you and becomes overwhelmed with excitement when they see the neighbors are also taking their dog for a walk across the street, if your dog is pulling on the leash, turn around and head in another direction and distract them by showing them their toy. Make them think that now you are going to play a game. Toss them their toy a few times. Now that they are focused on you, start walking again. If another distraction comes along, avert the distraction by repeating this exercise. When you feel they have done a great job keeping their focus on you, it is ok to reward them with a treat or a piece of dog food. This positive reinforcement can help the dog better understand what you are trying to teach them. 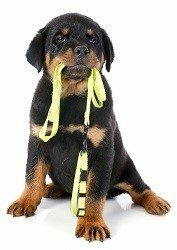 It takes a lot of patience to correct leash pulling, and it requires a lot of walking in circles, but eventually your Rottweiler will get the hint and understand that leash pulling actually gets you nowhere.